#TMP The author unveils many mysteries, some of which have caused confusion within the Church. Now the whole set, all 832 pages, is laid out for you to learn the significance of these amazing prophets. The last twelve books in the Old Testament are generally called the Minor Prophets. In the Bible, prophecy makes up almost one third of the content, yet in most cases, prophecy is the subject that is being neglected in the majority of churches. Why? Because there is much controversy as to the meaning of it. To understand prophecy, we must read, hear, and study the prophetic books. While they are indeed addressed primarily to Israel, we will quickly notice that the Gentiles are included. 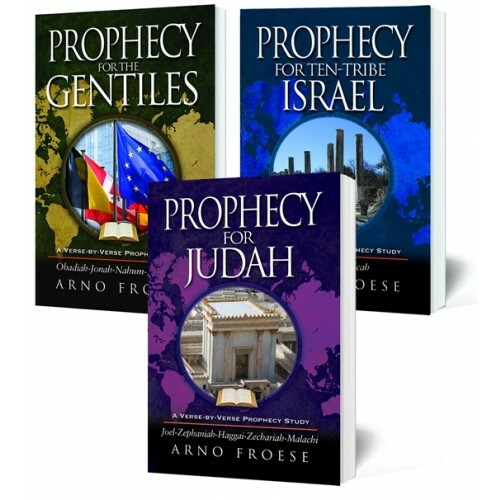 This three-volume set—titled Prophecy for the Gentiles, Prophecy for Ten-Tribe Israel, and Prophecy for Judah—details and explains in plain words each verse. This is an extraordinarily revealing, verse-by-verse prophecy study you’ll definitely want to have in your library. We have divided the titles to highlight the world, Israel and Judah. When you see how this all interconnects, you will find it to be a most fascinating study. The entire three-volume set, regularly at $44.50, can be yours for only $29.50, and we pay the postage (USA only).